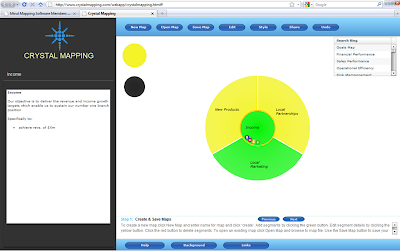 A few months ago I came across Crystal Mapping a new visual mapping cloud app. developed in the UK. I was intrigued by their approach which uses radiating circles rather than nodes and lines to represent association and relationships so I had and a chat with the brain behind the product; Mark Wogan. Mark started his career with Ford Motor Co in Sales & Marketing. He then moved on to co found the TUP Group, a successful MIS company. In 2003 Crystal Mapping Ltd was founded, and crystal mapping was released as a new way of visually presenting and communicating information. Mark wrote a very informative book titled “Crystal Mapping: The Bigger Picture”, which was published during 2007. 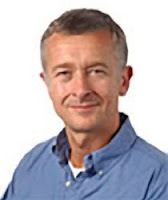 As CEO of Crystal Mapping and a Fellow of the Royal Society of Arts; Mark spends his time committed to finding new ways of combining words, pictures and numbers to present information and knowledge. While talking with Mark it became clear the circular Crystal Map approach had real merit. 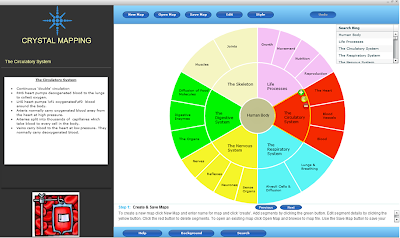 This product adds to our expanding world of visual mapping tools in a very unique format. So here’s a brief synopsis of the idea with a few questions answered by Mark. The first thing you’ll notice is the point I make about it using circles to organize discrete bits of information into a unified whole rather than the traditional ‘root and branch’ style of mind mapping approaches. The thing that strikes me right away is the sense of unity you get from such a clean view of the information. It really does start to give the viewer a feeling of gestalt and that the whole is indeed greater than the sum of its parts! Of course you’re not limited to three levels of details as to delve deeper into the map, click on any segment and it takes you to another level of iterated detail. A visual audit device on the left side of the screen leaves a ‘breadcrumb’ trail to always make it clear where you are in the map. From a utility point of view, as you’d expect you can attach/embed hard disk files, URL links, images and copious notes to the segments to enable the viewer to access more detail about any particular segment but – as Mark say’s, you never lose sight of the bigger picture so whatever content you look at its always in context, helping viewers to form a real understanding of whatever is being presented in the map. Mark, tell us how you came up with the idea of Crystal Mapping and why. Well it was really a case of necessity being the mother of invention. In a previous business I needed a way of presenting company objectives to everyone in a way that was inclusive across functions and geography and that represented the unity of the business. It was that word ‘unity’ which got me drawing circles as they just seemed like the logical way for me to represent that we are all part of the same team, and everything else stemmed from there. However I didn’t start the business which eventually became Crystal Mapping till a few years later. Why didn’t you use a more traditional mind mapping approach to organise your thoughts and represent your ideas for the business. To be honest the ‘node and line’ approach didn’t really seem to me to convey the ‘unified – one team’ relationship I was trying to represent. Mind maps are great in some contexts but you do get the feeling that right now they are pretty much used in a blunt manner for everything – a bit like a guy with a hammer seeing everything as a nail! I think you’ve made the point yourself Wallace that not everything as a visual mapping solution has to be a mind map – it’s time we had more variety to meet the different demands of the visual mapping world. So what’s the benefit of crystal mapping over mind mapping and why would business use a crystal map rather than a mind map. In my mind the bigger question is getting business users to appreciate the generic benefits of visual mapping in the first place. As you’ve mentioned before we are still a long way off mainstream acceptance! So assuming we have a receptive audience who are turned onto visual information management, we have to provide them with the right solutions to their needs. My view is that there are certainly many ways to ‘skin a cat’ (such a quaint phrase) but it definitely doesn’t always have to start with mind mapping. For example if you want to communicate your company / team objectives; using a crystal map gives you a much more one company – one team feel as everything is joined to the core of the business so employees see themselves as part of the bigger picture. In education my research and feedback from schools is that crystal maps offer a great alternative to mind maps as they are much more ordered and structured and thereby allow students to recall the content more easily. Crystal Mapping is a cloud app – do you think mainstream business users are going to embrace cloud technology? I know there is a fair amount of debate about whether business is ready and willing to embrace ‘the cloud’ due to data security issues of their information being ‘off site’ but I believe this is more apparent than real. Just as we as individuals initially reacted very cautiously to internet banking but now think it a necessity, so will business start to adopt and benefit from the utility and cost advantages of cloud technology. Personally I would be far more worried if I were running a desktop/server only software business. Why do you believe users will purchase and subscribe to Crystal Mapping? Because its good value for money as cloud apps are, it’s easy to use and it ‘does what it says on the tin’ i.e. it helps you clarify your thoughts and ideas and makes them clear to others – crystal clear if you like! More than that little pitch response – CM is great for collaboration (a real benefit of cloud apps.) and the fact that we have a desktop version which synchronizes with the web app. Being server based means; if our business users want to ‘play safe’ – they can, and we don’t need to store their ‘sensitive’ files outside of their own internal server comfort zone. On top of this we have some features that make CM unique. For example we have built in an auto-generation feature which creates a map from one word for education and business research. So if you wanted to build a map of RFID in the retail industry let’s say – you type in ‘RFID Retail’ and the app builds the first level of the map. You can then edit as you like and continue asking the system to auto generate your map content – not just the segments but the Notes content as well. We also have a search feature that helps users build maps by automatically creating search strings in Google, Bing, Flickr, You Tube and Wikipedia. This not only helps you find the content to help build you map but lets others continue the search for more detailed or specific information as they might require. Another important capability of CM is the data load of any given map stored in the cloud. We currently allocate 1GB of data storage for subscribing cloud user; this will indeed increase when we have a more defined user base. We have everything in place to increase the data load capability significantly according to demand, and we shall offer specific data storage levels priced for corporate users. What is your approach to The Voice of the Customer? At Crystal Mapping, we firmly believe the user base defines the future direction of this product. With this in mind, we proactively measure the needs and wants of our users. We also believe communication is a key factor in the continuous improvement process. Pricing is per account and at the time of this interview is offered at £29.99 (around $45/€33 at current exchange rates). We offer site/group and volume discounts and education discounts. MindGenius Ltd announce the upcoming release of MindGenius 3.5, which has been developed as part of their ongoing commitment to product development and response to customer needs. This release of the mind mapping software contains an integrated Gantt view, providing extensive project management capability within MindGenius without the need to export to other applications and is free to all existing MindGenius V3 customers. A unique and powerful feature of the MindGenius Gantt view is the ability to use the map explorer to focus on specific areas of the project plan. Since it is not unusual to have a project plan of a couple of hundred lines or more, this makes it much easier to plan and schedule projects, easily switching back and forward between the map and Gantt views which are continually in sync with each other. The Gantt view also integrates with the MindGenius quick filters, simplifying project management by allowing the user to quickly identify tasks assigned to each individual, tasks due or overdue, milestones, critical path and status. MindGenius 3.5 is free to all current V3 customers and will be available during the week of March 15th 2010. The Gantt view further extends MindGenius’ reputation as the mind mapping tool for business. They have also added the Gantt view to MindGenius Education as a cost effective solution for the management of student, school, college and university projects. For more detailed information on MindGenius, please visit http://www.mindgenius.com/. Method Neutral is defined as; “Multiple modes of information expressed within a flexible workspace”. The term “method neutral” is an oxymoron, and IMO; it is a genius breakthrough approach to challenging existing perceptions to the data, information and knowledge development processes. Graphical information management has been around for a while, and it has unfortunately continued to be restricted to the fringes of the mainstream. This is to a degree, due to a certain radiant technique being touted as being the “one size fits all” solution. A single hierarchy while being the basis for reasonably effective graphical communications, has become rather passé when assessing the needs (read demands) of the forward thinking information manager. Multiple modes of expressiveness are now needed within products that offer end to end capabilities that combine various information management modes. Convergence is the key request from information management expressed within corporate business. Method neutral offers flexibility in a convergence model, cutting through the one size fits all approach. The three main arenas for information management are; personal, academic and business. While looking at the overwhelming range of software offerings currently available, we simply have way too many choices. Choice is (we are told) good and competition is what motivates creativity; so why do we keep on getting the same old same old from the Mind/Visual mapping developers? Method neutral has its origins at Mindsystems, the developer of Amode, and version 2 was recently released. Amode gives the user the ability to experience a further enhancement of method neutral in a completely new functional approach within the product. This new function is called ThoughtPad; offering the user the ability to associate almost any kind of graphical expressiveness that can be associated with the central mode of the database knowledge tree. The genius of this new approach; we are no longer constrained by the many singular formats that are either Mind, concept, flow, argument and others offered by some software developers. We can simply use them all, and then some. Information is the core function and importance that is contained with the knowledge database tree mode. Having the ability to associate almost any kind of graphical idea and visual thinking within the ThoughtPad; giving the user absolute freedom and comfort of knowing they are not constrained by a singular format. Mindsystems has taken this opportunity of shaking up the status quo, and I do believe this is exactly what is needed within the Visual information management arena at this time. As a forward thinking Information Handler, IMO there’s 4 main points of your future success to consider. Mindsystems Amode offers the user these and more. Of course there are more points to consider; it is however very clear though that Mindsystems Amode has developed an information management tool in Amode that offers an end to end complete package for the forward thinking information handler. 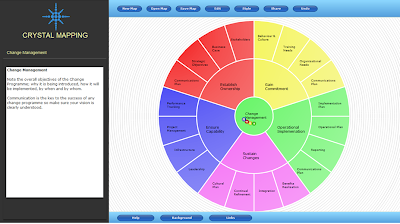 The information management arena offers some wonderful products, and I firmly believe Mindsystems Amode takes the lead for the business/project management approach to Personal, Academic and Business knowledge handling. I certainly look forward to experiencing the further evolution of this product; it has a very light footprint, an amazing stable database load. The new Mindsystems ThoughtPad will take the Visual mapping arena into a whole new mindset of flexible graphical expressiveness. The status quo shift is CHANGE; nothing to be scared of and much to embrace. So; do you want the same old same old, or do you want to move forward with confidence, control and flexibility?